The Laziest Vegans in the World: Vega-riffic! For almost three years now I've been using the supplement Vega religiously. 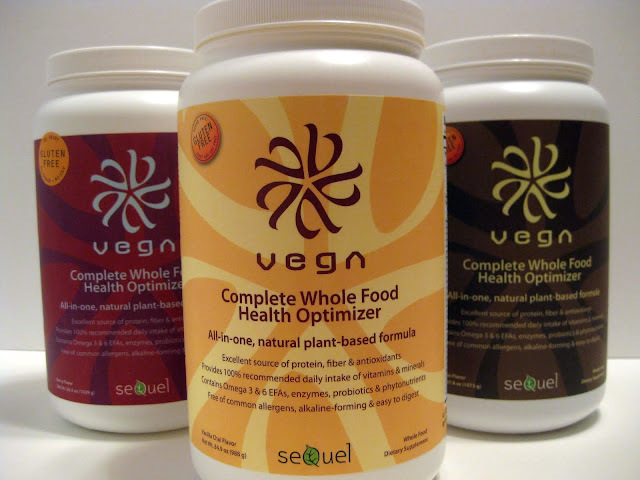 Produced by Sequel Naturals and formulated by Vegan Triathlete Brendan Brazier, Vega is the first all whole food Vegan supplement. Vega is loaded with vitamins, minerals and protein to provide an easy way to get a majority of your nutritional requirements. In a perfect world you would be able to get all of that nutrition from you daily meals, but I just don't have the time to do that. Every day right before I go to work I make sure to whip up a serving. I hate to eat anything when I wake up but I also know that the first meal of the day is the most important. Vega is always my breakfast! FYI- my favorite flavor right now is Vanilla Chai. I was introduced to Vega by Robert Cheeke, who is a Vegan bodybuilder. Robert produced a documentary called Vegan Fitness Built Naturally. I bought the DVD hoping for some workout tips as I had just started working out at the gym. Watching the documentary made me really proud to be Vegan. The best part is you have three different body types and exercise styles represented in the film. Robert gives you the bodybuilding insight, Tonya Kay dazzles with her aerobic skills and Brendan displays the workout of a Triathlete. You know, we can do anything a meat eater can. Vegans can be ripped, muscular and energetic. So while Vega might be the norm for the typical fast food Vegan, I would wholeheartedly recommend it for someone always on the go. It's a tad on the expensive side but you have to realize you get what you pay for. Vega can be found online and at almost any Vegan/ Vegetarian supermarket. I'm partial to Vegan Essentials because of their monthly 15% coupons but Vegan Proteins and Food Fight would also be fine choices. Vega is awesome -- I use it as a recovery protein after a hard workout, either mixed in with a little orange juice and some water, or mixed in soy yogurt. I thought I was the only one who used the phrase, "I put Amy through college" :) !!! Cool, I've never tried it with anything but water. OJ and yogurt sounds interesting! Ha! My other saying is "I wish I had stock in Amy's."